Transmission flush: Properly flushing your transmission to clean out debris and old fluid. When your transmission needs new fluid the process is called a "transmission flush" and new fluid is added. This is done according to the schedule of your automobile's manufacturer for each model and year. In some cases older cars should be flushed more recently as filters can become clogged quicker causing the transmission to run hot and break down components and weak parts. The flush process, overwhelmingly aggress upon by mechanics and technicians, is a process that must be done. Few argue that force flushing a transmission's fluid will damage weak parts and lodge debris in odd places inside the transmission and that they get stuck and will cause problems later. This process is not a flush, but rather a drain and change job. It is not as thorough and leaves some of old debris, metal shavings and fluid in the transmission system which may cause damage. 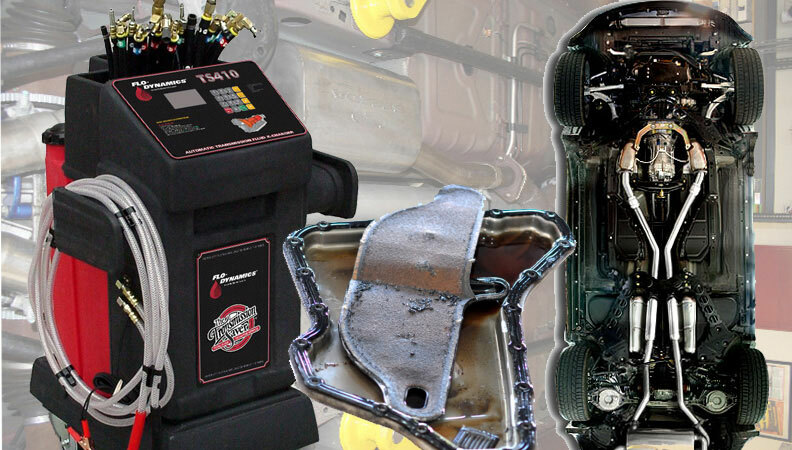 A good transmission repair and maintenance shop in Fort Lauderdale like our shop will perform this procedure the correct way. One way is to flush your system by using a specialized machine that pumps a transmission cleaning solution through the system and lines pushing and cleaning out all grime, metal shavings, old fluid and other debris until the lines are running clean. The machine is connected to the cooler line that cools your transmission. From there the solution enters the transmission from the Transmission Fluid Oil Exchange Flush Cleaning Machine. The automobile's pump uses it's pressure to circulate the solutions and force the old fluid out and the new fluid in. The premium method which costs a little more is a Pump Inlet Flush. This method removes everything including the old oil and debris in the pan that the previous flush method cannot remove. The lines are hooked up directly to the pump intake valve which transfers fluid throughout the system and through the drainage pan. The time involved and the extra transmission fluid needed adds to the cost. Once this is complete and only then, does the technician refill the transmission with brand new fluid according to the manufacturers up-to-date specifications and a new filter is put in. Make sure that you don't have them "force blast" the fluid. It may save money, oil and time but it can damage seals and lodge debris.